Originally planned as a free mod for Quake, development on Team Fortress 2 switched to the GoldSrc/Half-Life engine in 1998 after the development team Team Fortress Software – consisting of Robin Walker and John Cook – were first contracted and finally outright employed by Valve Corporation. At the point of Team Fortress Software’s acquisition production moved up a notch and the game was promoted to a standalone, retail product; to tide fans over – since, as well as time issues, much of the Team Fortress player base had purchased Half-Life solely in anticipation of the free release of Team Fortress 2 – work began on a simple port of the game which was released in 1999 as the free Team Fortress Classic (TFC). Notably, TFC was built entirely within the publicly available Half-Life SDK as an example to the community and industry of its flexibility. 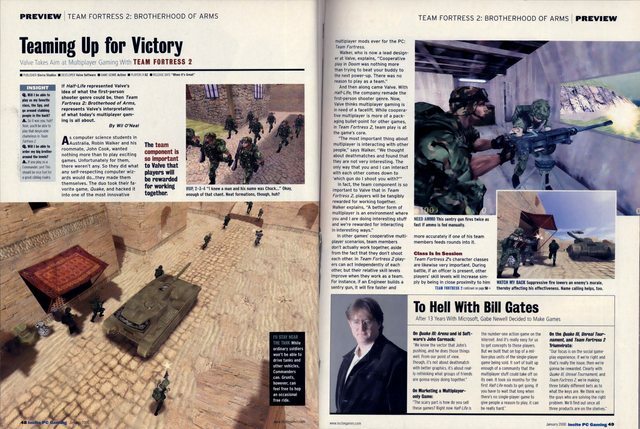 Preview article from Incite gaming magazine, January 2000. Walker and Cook had been heavily influenced by their three-month contractual stint at Valve, and now they were working full-time on their design, which was undergoing rapid metamorphosis. Team Fortress 2 was to be a modern war game, with a command hierarchy including a commander with a bird’s-eye view of the battlefield, parachute drops over enemy territory, networked voice communication and numerous other innovations. This initial design for Team Fortress 2 is quite possibly the only game to have spawned a thriving sub-genre without ever being released itself. The new design was revealed to the public at the 1999 E3, where it earned several awards including Best Online Game and Best Action Game. By this time Team Fortress 2 had gained a new subtitle, Brotherhood of Arms, and the results of Walker and Cook working at Valve were becoming clear. Several new and at the time unprecedented technologies on show: Parametric animation seamlessly blended animations for smoother, more life-like movement, and Intel’s Multi-resolution mesh technology dynamically reduced the detail of on-screen elements as they became more distant to improve performance (a technique made obsolete by decreasing memory costs; today games use a technique known as level of detail, which uses more memory but less processing power). No date was given at the exposition. In mid-2000, Valve announced that development of Team Fortress 2 had been delayed for a second time. They put the news down to development switching to an in-house, proprietary engine that is today known as the Source engine. It was at around this time that all news ran dry and Team Fortress 2 entered its notorious six-year radio silence, which was to last until July 13, 2006. During that time, both Walker and Cook worked on various other Valve projects – Walker was project lead on Half-Life 2: Episode One and Cook became a Steam developer, among other tasks – raising doubts that Team Fortress 2 was really the active project that would be repeatedly described. When the Half-Life 2 source tree was leaked in late 2003 three Team Fortress 2 models were included, along with direct references to the game in the stolen source code. They consisted of an alien, Combine-like grunt and a very cartoon-like and out-of-proportion soldier. The code was interpreted by fans as making references to the Seven Hour War, an integral part of the Half-Life story; however, the two leaked player models did not look combine or human. The Source SDK was released with the Half-Life 2 source code, and also provided references to the game. Some code merely confirmed what was already believed, but other segments provided completely new information, such as the presence of NPCs in multiplayer matches, the possibility of the game taking place in the Half-Life 2 universe, fixed plasma gun and missile launcher emplacements, and more. None of the leaked information appears to have any bearing on today’s version of the game. This iteration was mentioned in an August 2007 interview with Gabe Newell by GameTrailers, in which he mentions “Invasion” as being the second-phase of Team Fortress 2’s development under Valve Software. The next significant public development occurred in the run up to Half-Life 2’s 2004 release: Valve’s Director of Marketing Doug Lombardi claimed both that Team Fortress 2 was still in development and that information concerning it would come after Half-Life 2’s release. This did not happen; nor was any news released after Lombardi’s similar claim during an early interview regarding Half-Life 2: Episode One. Near the time of Episode One’s release Gabe Newell again claimed that news on Team Fortress 2 would be forthcoming – and this time it was. Team Fortress 2 was re-unveiled a month later at the July 2006 EA Summer Showcase event. Walker revealed in March 2007 that Valve had quietly built “probably three to four different games” before settling on their final design. Due to the game’s lengthy development cycle it is often mentioned alongside Duke Nukem Forever, another long-anticipated game that has seen many years of protracted development and engine changes. The beta features three multiplayer maps which contain commentary on the game design, level design and character design, and provide more information on the history behind the development. The commentary suggests that part of the reason for the intentionally cartoonish style was the difficulty in explaining the maps and characters in realistic terms — questions like “Why would two teams put their bases so close to each other?” become more relevant when there is an emphasis on realism in a game. The art style for the game was inspired by J. C. Leyendecker, as well as Dean Cornwell and Norman Rockwell. Their distinctive styles of strong silhouettes and shading to draw attention to specific details were adapted in order to make the models distinct, with a focus on making the characters’ team, class and current weapon distinct and easily identifiable. The Scout was one of the first TF2 classes that was created when Valve decided to try out a more stylized approach to the game. Various character designs were drawn before find the final one. Also, various weapons were removed from the final game and even the levels were a bit different in the beta (as you can see from the videos below) . In the beta version of Team Fortress 2, the Demoman had six grenades to spill out. However, they were removed for balance issues. Many more unused and beta models can still be found in the game’s code, as you can read from Uber Charged! Thanks to FullMetalMC, Ace.Dark and NastyKill for the contributions! In 1995, the first incarnation of the game was announced. Prey was envisioned by 3D Realms as the first of a number of games to be running on unique, cutting edge game engine technology, developed in house. In this sense the project played the same role as Unreal did for Epic Games, and it would retain this role in the company’s strategy throughout its development time in the 3D Realms studios. Prey as a game was to go through many different forms during this first development period. A rapid succession of different designs were outlined by Tom Hall (previously of id software and later of Ion Storm), who was at that time fresh off the Rise of the Triad team at Apogee Software. After about a year’s worth of work, however, Tom Hall abandoned the project and left the company to form Ion Storm with ex-Id compatriot John Romero. At this point 3D Realms brought on Paul Schuytema to begin the next phase in the game’s development. The new team would go on to create the most coherent design the game ever had. The alien abduction theme from Hall’s work was retained, but now the game was to be set on a massive, living alien space ship inhabited by a number of different alien races (three of them collectively known as the “Trocara” and a fourth called the “Keepers”), the player himself would take the role of a Native American hero, called Talon Brave. The game was the first in the genre to make use of portal technology, a feature that allowed rips in space to be created, moved and reshaped in real time. This was to be a core feature of the gameplay, along with heavily destructible environments. It was also thought at the time this engine would be used for Duke Nukem 5 (the game after Duke Nukem Forever). Demonstrations of these features drew widespread acclaim at the 1997 and 1998 E³ exhibitions – the television program Infinite MHz was able to capture exclusive footage of the game’s private behind-closed-doors demo at the games both E³ showings. Shortly after the Schuytema variant of Prey disbanded, 3D Realms attempted again to revive the project by bringing on tech programmer Corrinne Yu in November of 1998. Development of the game itself was not part of this effort, Yu was working by herself on the game engine exclusively. However, after a time, this iteration of Prey fell apart as well. 3D Realms and Corrinne Yu parted ways, and Prey began its long period of inactivity in 1999. The title was put on indefinite hold (although never formally cancelled, contrary to popular opinion). On March 8, 2000, Prey.net (an early Prey site with a section about KMFDM) released a Real Audio file of a third KMFDM song: “Missing Time”, which was going to be part of the Prey soundtrack but was featured in the movie Heavy Metal 2000 instead (under the name MDFMK which is a side project of KMFDM members during their temporary break-up). Rumors of this new project leaked out to the public in 2002, through the website Evil Avatar, but were at that time neither confirmed nor denied. It wasn’t until 2005, when the cryptic clue “Keep your eyes open for the unveiling of our next game very soon. ;)” appeared on the 3D Realms website that the previous rumors were confirmed in any way. This was followed by a CNN article by Chris Morris, claiming that Prey was not only in development, but that it would be shown at E³. Soon afterwards, the official Prey teaser site was launched, confirming the game’s existence, and hinting that more would be revealed in the June issue of PC Gamer, which indeed featured a seven page article on Prey. On April 26, 2005 Prey was officially announced in a press release by 2K Games. On June 28, 2006 it was announced that Prey had officially gone gold for PC and XBOX 360.